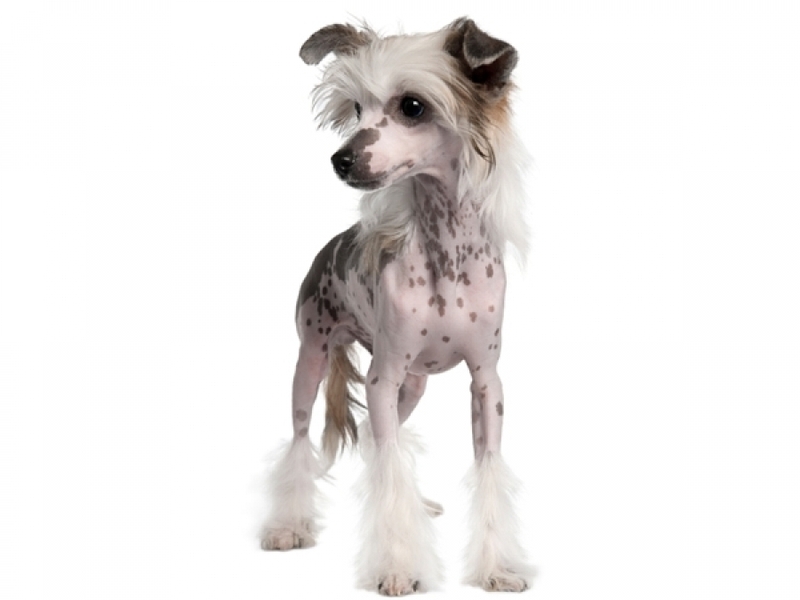 At first look, the "Hairless", and "Powderpuff" varieties of Chinese crested Dogs appear to be two different breeds, but hairlessness is an incomplete dominant trait within a single breed. The Hairless has soft, humanlike skin, as well as tufts of fur on its paws ("socks") and tail ("plume") and long, flowing hair on its head ("crest"). In addition to being an incomplete dominant gene, the "hairless" gene has a prenatal lethal effect when homozygous. Zygotes affected with double hairless genes (1 in 4) never develop into puppies, and are reabsorbed in the womb. All hairless Cresteds are therefore heterozygous. A Powderpuff has a long, soft coat. Both Hairless and Powderpuff varieties can appear in the same litter. The look of the Powderpuff varies according to how it is groomed. When its fur is completely grown out on its face, it strongly resembles a terrier; however, the Powderpuff is usually shaved around the snout as a standard cut. The amount of body hair on the hairless variety varies quite extensively, from the true hairless which has very little or no body hair and furnishings, to what is called a 'hairy hairless', which if left ungroomed often grows a near-full coat of hair. These hairy hairless are not a mix between powderpuffs and hairless Chinese cresteds, but are merely a result of a weaker expression of the variable Hairless gene. The mutation responsible for the hairless trait was identified in 2008. One famous Chinese crested dog was the hairless purebred named Sam, was the winner of the World's Ugliest Dog Contest from 2003 to 2005. He died before he could compete in 2006. Other Chinese cresteds, either purebreds or in mixes with chihuahuas, have finished high in the event as well. Both varieties require certain amounts of grooming. The Puffs have a very soft and fine double coat that requires frequent brushing to avoid matting. Although a Puff's coat does not continuously grow like that of some other breeds, it can grow to be quite long at full length. This breed has little to no shedding (see Moult). Maintenance of the Hairless variety's skin is similar to maintaining human skin—and as such it can be susceptible to acne, dryness, and sunburn. Hypoallergenic or oil-free moisturizing cream can keep the skin from becoming too dry when applied every other day or after bathing. Burning can occur in regions that are subject to strong UV-rays radiation, especially in lighter-skinned dogs. Many owners apply baby sunscreen to their pets before spending time in strong sun. Some Cresteds have skin allergies to Lanolin, so be cautious when using any products that contain it. The crested is not affected by many of the congenital diseases found in toy breeds. They are, however, prone to some of the conditions below. Cresteds have what is called a "primitive mouth". This means that most of their teeth are pointy like their canines. Hairless varieties of the Cresteds can be prone to poor dentition. Poor dentition may include missing or crowded teeth and teeth prone to decay when not properly cared for. Most dogs of the Puff variety have few, if any, dental defects. Eyes are a concern within the breed, having at least two forms of progressive retinal atrophy (PRA) which can eventually lead to blindness. For one of these forms of PRA, there exists a genetic test, prcd-PRA. Since this test can only reveal the existence of affected or carrier status of this one form of PRA, breeders and owners of the breed should still have regular eye exams by veterinary ophthalmologists. The breed also suffers from another eye disease called Keratoconjunctivitis sicca or dry eye syndrome (DES). Although hairless dogs have been found in many places in the world, it is unlikely that the origins of the modern Chinese crested are in China.The breed was believed by some to have originated in Africa and was called the African Hairless Terrier in several 19th Century texts, however, there is genetic evidence that shows a shared origin with the Mexican Hairless (Xoloitzcuintli). In the 1950s, Debora Wood created the "Crest Haven" kennel and began to purposefully breed and record the lineages of her Chinese crested dogs. The famous burlesque dancer Gypsy Rose Lee also bred Chinese Cresteds, and upon her death her dogs were incorporated into Crest Haven. These two lines are the true foundation of every Chinese crested alive today. Ms. Wood also founded the American Hairless Dog Club in 1959, which was eventually incorporated into the American Chinese crested Club (ACCC) in 1978. The ACCC became the U.S. parent club for the breed when the Chinese crested was recognized by the American Kennel Club thirteen years later, in 1991. The Chinese crested was officially recognised by the Fédération Cynologique Internationale in 1987, by The Kennel Club (UK) in 1981, by the American Kennel Club in 1991, and by the Australian National Kennel Council in 1995. The Hairless allele (the wild type) is a dominant (and homozygous prenatal lethal) trait, while the Powderpuff allele acts as a simple recessive trait in its presence. Zygotes that receive two copies of the Hairless allele will never develop into puppies. Thus all Chinese cresteds carry at least one copy of the Powderpuff allele. The Powderpuff trait cannot be bred out because it is carried by all Chinese cresteds (even the hairless ones). All Hairless Chinese crested have the ability to produce Powderpuff puppies, even when they are bred to another Hairless. On the other hand, Powderpuffs bred to another Powderpuff can never produce hairless puppies, since they do not carry the Hairless gene.